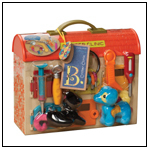 Our B. Critter Clinic features a hospital with 6 private rooms, 2 cute plush patients, color match keys and 5 tools. The stethoscope, mirror, syringe, tweezers and thermometer give you everything you need to make your "critter" all well. Critter babies love riding the merry-go-round! Merry-go-round spins as you turn the handle. Fish seats can detach from the carousel. Also features water spray & slide. Merry-go-round measures 6" x 4.5" x 6.5". 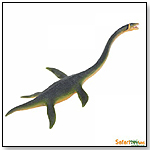 Seventy-five million years ago, there really were sea monsters, and this long-necked Elasmosaurus from was one of them. Wild Safari® Dinosaurs and Prehistoric Life were created for the dinosaur lover in all of us. Each Safari Ltd® hand painted figure is designed to stimulate the imaginations of children of all ages. 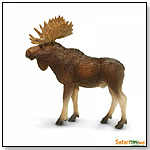 The North American Bull Moose is one of the largest instinct species in the deer family. These males are known for their prominent antlers and are gentle forest inhabitants who prefer temperate to subarctic weather! Our Wild Safari® North American Wildlife collection represents the many animals, great and small, that call North America home. Professionally sculpted and individually hand painted, Wild Safari® North American Wildlife continues the tradition of quality toys you expect from Safari Ltd®. Full of new life and renewal this spring, the Folkmanis® BABY LOP RABBIT is the pick of the litter. Animate the mouth and front paws of this cuddle bunny as you stroke and soothe its super soft coat. Make this puppet yours before it hops away! Dinosaur habitats include a high-quality figurine, and environmental base, and prehistoric slime, like lava, swamp slime, tar, or swamp water! Dinos can be slimed, and demo beautifully thanks to their themed base and hands-on slime. Millions of years in the making, Neat-Oh! Dinosaur Stompin' Grounds™ capture the real life world of dinosaurs where dangers lurked in lava lairs and tarry pits. There are four playsets each come with a hand painted dinosaur figure, a playbase, and lava, swamp slime or tar. — Barbara Fineblum, owner of Barstons Childs Play in Rockville, Md., told TDmonthly in a December 2014 interview that the Calico Critters Hopper Kangaroo Family was a best-selling play set at their store. The lights turn on and off in this spacious four-room townhome, and the room divider can be moved to create a fifth room. The home opens and closes for lots of decorating and pretend play fun. The moveable staircase and extra floor area can be used to create larger rooms. House measures 12"" x 12"" x 12"" closed, 21"" x 21"" x12"" opened. The Hazelnut Chipmunk Family lives in this home. Critters & some accessories sold separately. — In a December 2014 survey, two out of nine retailers told TDmonthly that this was a best-selling play set at their store. The Four-Headed Orange Dragon has little to fear, with four sets of eyes on the lookout for food and fiery colored scales that allow it to move through boiling hot lava pools. Safari Ltd® Dragons include the most colorful, creative, and varied dragon figures available. Some of our most intricate professional sculpting and eye-catching hand painted designs can be found in this collection. Let your imagination soar with our Fantasy figures! 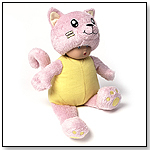 Fun and playful plush baby doll with kitty cat themed peekaboo. Soft and huggable plush pink and cream body and limbs with beautiful sweet baby face. Perfect for little baby fingers to grasp and explore. This plush unicorn is 27" long with tail (69 cm). Douglas Toys makes beautiful, soft, cuddly stuffed animals and infant plush with a distinctive expression or gesture that speaks quality and value unlike any other plush animal. Feel the earth shake as Tyrannosaurus rex, the tyrant lizard king, moves about its territory. This 1:40 scale Safari Ltd® T-rex replica was carefully reviewed by paleontologists to reflect the most up-to-date scientific information. With the endorsement of Carnegie Museum of Natural History, which houses one of the world's largest collections of dinosaur fossils, these educational toys have won numerous awards for excellence and authenticity. Each Carnegie Dinosaur Collectible is individually hand painted, resulting in vivid designs that appeal to the imagination and inspire learning. They are ideal for children and collectors both. Your little animal lover will have hours of fun with these lovable Good Luck Mini® Chimps! Minis are tiny hand-painted replicas. These soft figures are professionally sculpted and feature the realistic colors and lively detail you expect in the larger replicas from Safari Ltd®. People use Good Luck Minis® for wedding favors, classroom prizes, party decorations, giveaways, and imaginative play. This set includes 192 Chimp Baby replicas packaged in a polybag. 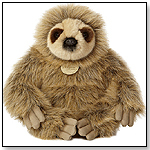 12" SLOTH This adorable lifelike Miyoni sloth with tremendous detail would love to come home with you today! — In a June 2015 survey David Campbell, owner of Amazing Toys in Great Falls, Mont., told TDmonthly that Fiesta was their store's best-selling plush brand. This lush and beautifully soft husky is almost life size...the details are amazing and the face is exquisite. The fur is silky smooth and soft as can be. — Phil Wrzesinski, owner of Toy House and Baby Too in Jackson, Mich., told TDmonthly in a June 2014 survey that Douglas Plush does well in their store, especially the dogs.